Big Tail Goombas are a variety of Big Goombas attached with Tanooki tails that debut in Super Mario 3D Land. Despite their rarity in their debut game, they appear frequently as late-game enemies in all later released Mario & Luigi games. 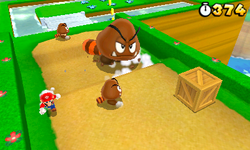 A Big Tail Goomba as it appears in Super Mario 3D Land. 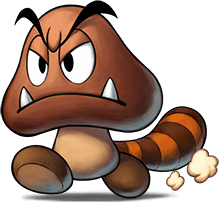 Like normal Tail Goombas, they move by leaping into the air, hovering to another area close to them, then swinging their tails upon landing—however, because they are larger than the average Goomba, their tail swing attack covers a larger radius. They are not much bigger than normal Goombas, though, due to their size being cut down to fit the screen. They first appear in World 1-1, but seldom appear after that. Big Tail Goombas give the player three coins when defeated, and in World 5-5, one gives the player a Super Leaf. In Mario & Luigi: Dream Team, Big Tail Goombas are found in Dreamy Neo Bowser Castle. They do not show up on the map. Instead, they appear alongside Mechakoopas or Antasmans. In battle, the large Goombas have two attacks; the first has them hovering towards Mario, which must be countered with a hammer, causing it to land on and damage another enemy, or else Mario will be rendered dizzy. The second attack has them spinning on the ground in a semi-homing pattern towards Mario. Mario can move out of the way or jump over the Big Tail Goomba in this attack. The other enemies briefly rearrange their positions during this attack, and they too will take damage if the Goomba spins into them. It may make itself dizzy, signified by a more violent spin; in this case, it sits for a second in front of Mario when near him, and then simply walks towards him. Big Tail Goomba returns in Mario & Luigi: Paper Jam. They are found in Bowser's Castle. Like in Dream Team, they do not appear on the map, instead appearing in battle alongside Boomerang Bros, Paper Boomerang Bros and Paper Dry Bones. They can also be fought in one room of Neo Bowser Castle. In battle, they have two attacks. Similar to Dream Team, their first attack has them hovering towards any one of the trio. They then will drop from the air onto the brother, who must then counter with the hammer. The Goomba can repeat this attack up to five times in one turn if countered successfully, each time damaging another enemy in the process. The second attack has them briefly glancing toward Mario or Luigi, then jumping in front of the brother and spinning their tail, which must be jumped over. It can do this twice in one turn if dodged, after which it will spin toward Paper Mario, who must jump over the Goomba. The last attack can be countered if Paper Mario manages to land on top of the Goomba, and if countered it will damage any other enemies involved in the battle. Big Tail Goombas appear in story mode of Minion Quest: The Search for Bowser in Mario & Luigi: Superstar Saga + Bowser's Minions, where they appear as enemies and recruitable allies. They are melee troopers, and attack by running into enemies. Their special attack, Spin Cycle, allows them to damage enemies by spinning their tails. Big Tail Goombas have high HP and power. In Mario & Luigi: Bowser's Inside Story + Bowser Jr.'s Journey, Big Tail Goombas appear in the new Bowser Jr.-centered mode as enemies and recruitable allies. They return as melee troops, and are weak against Ninjis and yellow Shy Guys. Level 26 Notice: Stats in parentheses are from the game's Easy Mode. Minion Quest: The Search for Bowser / Bowser Jr.'s Journey bio: Bulky blokes with high POW and HP. They can sweep up foes by spinning their tails. This page was last edited on April 14, 2019, at 08:10.